OFFICIAL NOVINT BLOG: FAQ: Valve, Pistol Grip, Black Falcon! Hello everyone! This has been a VERY busy week for us. Between our Valve announcement, and information about the Pistol Grip and Black Falcon, there’s a lot going on at Novint! I thought I’d take a few minutes to answer some of our most common questions regarding everything. Q: When will the Black Falcon be available? A: We expect the Black Falcon to start shipping in mid to late July. The Black Falcon has an MSRP of $199.99. Q: When will the Pistol Grip be available? A: We expect the Pistol Grip to start shipping in mid to late July as well. It has an MSRP of $19.99. Q: Can I purchase The Orange Box bundle now? 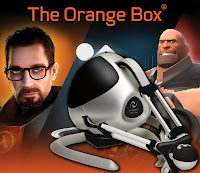 Q: What if I already own a copy of The Orange Box? Can I still take advantage of the bundle? A: If you already own a copy of The Orange Box you can still purchase the bundle and we’ll substitute a different game for you. Q: What are some of the AAA titles that are available for the Falcon? A: We have announced deals with EA and Valve. We have Battlefield 2, Battlefield 2142, Madden NFL 08, Tiger Woods PGA Tour 08, NBA Live 08, Need for Speed Pro Street, Half-Life 2, Episode 1 and 2, Team Fortress 2, Portal, Counter-Strike Source, and upcoming Left 4 Dead. Feel free to leave additional questions in the comments section below! Also, we’ll be posting more information from our Press Event in New York and I’m going to post my thoughts on the very first playables of Tiger Woods and Battlefield2! Hello i love your falcon ! But i have a question, if i have already bought any of the game like advent rising or battlefield 2 and 2142 will i have to buy them again full price for the falcon edition or will a patch be released for anybody? Hi anonymous - right now we're focused only on the specifically mentioned titles from Valve. I've put in a note to Novint's CEO who may be able to offer you additional information. Keep checking back at the Comments Section! Hi Killercow. It depends on the publisher regarding the details on games you may already own. We'll be offering patches for the EA titles that you can download from NVeNT. For Advent Rising - you'll need to purchase a new version of the game via NVeNT. The updates for Valve titles will be distributed via Steam. I have the same question as somebody had before. Will there be Day of Defeat Source support? Even if will not support it, it wont be deal breaker for me as its only one of the games i play (its my favourite one though). So far I don't event have Falcon yet but as soon as the Pistol grip will be out I will buy one. As I'm in UK it will be pain to buy one as no official retailer for it in UK (probably have to import it) and the price looks bit much at first sight but I wont care as im more than sure it will live up to my expectations. The hardest thing is to wait for it.